Nicole Richie is known for her unique sense of bohemain relaxed style, Nicole Richie never looks like she had tried too hard yet her outfits are always amazing. Nicole Richie creates her look using floaty one-off printed vintage pieces from maxi dresses to kimono's. "I'm a big vintage shopper and I love thrift stores. The beauty of anything vintage is that you’re not going to see lots of other people in the same thing. I like to be different." - Nicole Richie. Nicole is known to shop in expensive vintage stores such as Decades, where dresses can cost into the £1000's. If you are looking to achieve Nicole Richie's vintage inspired boho look without breaking the bank, I have found the perfect online vintage store. 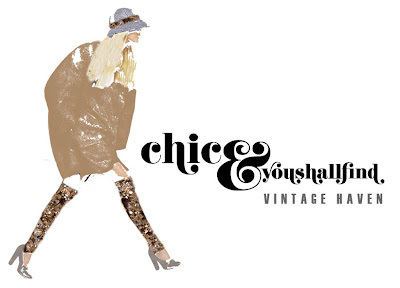 Chic And You Shall Find are a Los Angeles based online store, their Mantra is to provide unique pieces as in today's world of carbon-copied style, why not get your fashion fix where true uniqueness meets wallet-friendly prices and web-only convenience? Founder Brenna Egan is a former fashion editor and Vogue staffer who found her true entrepreneurial calling while meandering through flea markets, thrift shops and estate sales across the globe. On the days she's not shooting, styling or writing "past life" stories for the site, you'll catch her on set styling for someone else or hiking the canyons of LA in oversize cat-eye shades with her pup Brigitte Bardot in tow. This is an awesome site! Thanks for sharing!! !